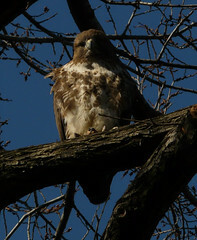 Carol Vinzant/animaltourism.com With an uptick in sightings of red-tailed hawks in the East Village, conservationists are concerned about the dangers posed by manmade perils such as birds colliding with buildings. 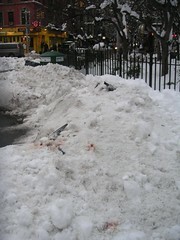 Below: The bodies of dead pigeons in Tompkins Square Park. 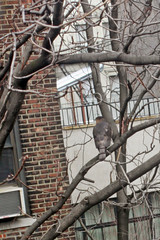 Those of us at The Local would like to believe we offer a rather respectable bird’s eye view of the East Village but stand humbled below the neighborhood’s newest migrants: the red-tailed hawks. Much has been said about the hawks’ return to Tompkins Square Park and the recent rescue of a red-tail from an airshaft on East Third Street last month, but despite the hawk-friendly hubbub, environmentalists are still concerned that some East Village buildings may pose a threat to the birds. 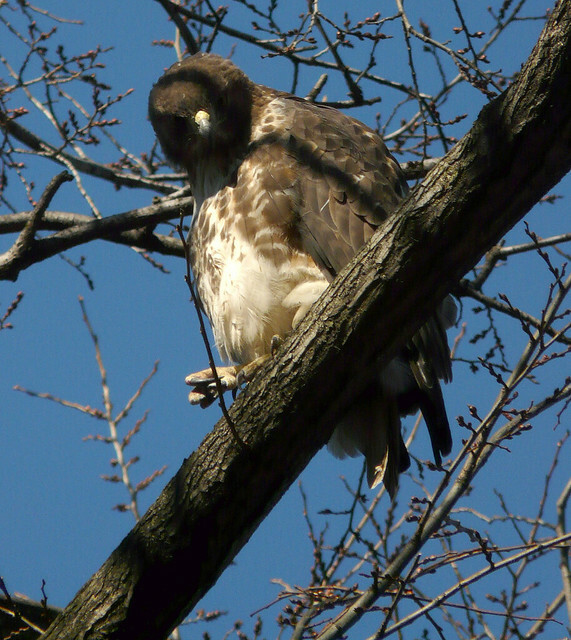 According to Glenn Phillips, executive director of New York City Audubon Society, a juvenile red-tail hawk died several weeks ago after crashing into a window on East Fourth Street; and while such collisions are less publicized than bird rescues, they occur frequently in the East Village and the East Coast migratory route on which it lies. So frequently, in fact, that research by Audubon has shown that 90,000 migrating birds die after hitting New York City buildings each year. Experts say manmade factors like poor architectural designs, which often rely on the aesthetics of large glass windows and bright lights, can easily disrupt a bird’s innate navigation process and lead to higher numbers of bird casualties, especially in populated areas like the East Village. In response to the influx of wild birds, the Urban Green Council and New York City Audubon held a roundtable discussion last month to review bird-safe building practices like the use of non-reflective glass and mesh lattice-work, both proven deterrents for flying birds. But Mr. Phillips says that to his knowledge, there are no working architects in the East Village who are following the guideline, a 55-page manual explaining the devastating scale of bird collisions and the retrofitting techniques to stop them. 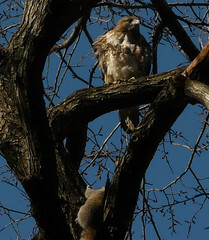 Carol Vinzant/animaltourism.com Tompkins Square Park has become a popular location for spotting red-tailed hawks. Even the non-profit group Project for Public Spaces, which operates from the former New York City Audubon building on Broadway in the East Village, says that while they have collaborated with NYC Audubon in the past, they are unaware of any initiatives for bird-friendly building developments in the area. One New York architectural firm, however, may prove a model for future East Village projects that wish to incorporate more bird-protecting features. FxFowle, which has collaborated with both New York City Audubon and the Urban Green Council, became one of the first firms in the nation to pioneer the use of a German-developed glass called Ornilux, a glass covered in UV-reflected coating that is invisible to humans but detected by birds. The glass, which is more expensive than traditional glass, was incorporated into FxFowle’s design for the Center for Global Conservation at the Bronx Zoo in 2009, according to Brien McDaniel, the firm’s public relations director. And while the East Village awaits similar projects to accommodate the increasing traffic in its skies, Sarah Aucoin, the director of Urban Park Rangers says the re-emergence of red-tailed hawks in the East Village is a positive sign. She calls it evidence of efforts to reintroduce the area’s native species in Tompkins Square Park, which has become a more attractive ecosystem for the birds. Mr. Phillips agreed that the park’s vast improvements over recent years have influenced the return of native birds and other species to the city, but he also acknowledged that their appearance in the East Village may be due to their general rise in population outside the city, spilling animals in. Kelly Samardak Birds of prey have been seen in other parts of the neighborhood, too. It’s not known why the birds’ nesting practices are evolving, but that smaller parks like Tompkins possess the basic necessities that the red-tails and other Savannah birds need, like green open spaces “in places that are losing green space rapidly,” according to Mr. Phillips. A park, he said, becomes a critical oasis, especially among the potential perils of Manhattan’s skyscrapers. But despite ongoing threats of collisions, nesting in the East Village may be preferable for birds because urban sites are unlikely to fall down or blow over in a storm, while a tree might. Man-made structures offer steadier support, and for raptors — birds of prey — like the red-tails and the cliff-dwelling peregrine falcons, the rats and pigeons of the East Village are dependable food sources to be enjoyed without the pressure of their own predators. In fact, Ms. Aucoin cautions that if conditions for wild animals in the East Village become too ideal, once-admired species can easily become pests. But with human factors like traffic and rat poison remaining fixtures of city life, and glass buildings looming ahead into the future, conservationists may continue to have to protect the area’s wild birds, rather than contain them. Join the conversation: Do you think the East Village should take the red-tails under its wing and offer more protection for the birds? This post has been changed to correct errors; an earlier version misidentified the Center for Global Conservation at the Bronx Zoo. The post also incorrectly noted that a special glass that can be detected by birds would be used during a renovation of the Jacob K. Javits Convention Center.